A brief marketing lesson today… and a request for a small favor. There is almost nothing more powerful than strong social proof. People are STRONGLY influenced by what “the crowd” is doing or saying. And today, I’m going to attempt to generate some for my own personal benefit. A REAL book publisher with several NY Times best-selling authors on their roles has asked me for a book proposal. They think there’s a market for a book about my experiences with my mentor… the late, great copywriting legend, Gary Halbert. More Impact If YOU Told Them! So while I’m scribbling away at my proposal (with yellow pad and pen, remember? )… if you’d like to see a book authored by by yours truly and published by a well-respected publishing company… could I please impose upon you to add a brief comment below? 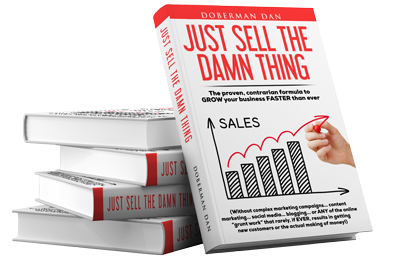 I’ll do my best to make it one of the most valuable (and entertaining) marketing books you’ll ever add to your library. MUCH more valuable… with many proven techniques that REALLY WORK… than most of the ripoff $2,000 courses sold by the IMGOBC (Internet Marketing Good Ole Boys Club). Please… if I’ve ever provided any value to you in any way over the past several years… would you please post a comment below to show the publisher you’d be interested in buying my book about Gary Halbert? If not… that’s OK, too. I appreciate you reading this… and I really appreciate having you as a subscriber. Seriously… your comments and support… and dare I say love… are quite humbling to me.